Before Horizontal Air Flow (HAF) systems were developed, it was common to find 10°F to 15°F difference in nighttime temperature between the opposite ends of a greenhouse. Plant growth and quality often reflected this unevenness. Today with a properly installed HAF system, there should be no more than 2°F difference anywhere in the greenhouse. Air is heavy. 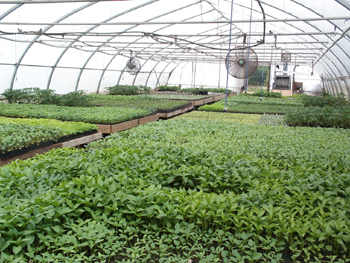 The air over every square foot of floor area in a greenhouse weighs about one pound. A 30′ x 100′ greenhouse contains about 1-1/2 tons of air. Once the air is moving, it will coast along like a car on a level road. This is why HAF is so efficient. It takes only four small fans to keep the air moving at 50 to 100 feet per minute in the above greenhouse. Besides the obvious advantage of more uniform temperature within the greenhouse, HAF systems can reduce the incidence of foliar diseases. The moving air removes moisture from the plant canopy, resulting in a drier microclimate. When leaf temperatures are allowed to cool much below the air temperature, the dew point is reached and condensation occurs, providing an ideal environment for disease organisms. Radiant cooling on clear nights, especially in non-infrared poly covered houses, will cool plant leaves several degrees below air temperature. HAF will reduce this difference. During daylight hours, photosynthesis depletes the carbon dioxide that is in the boundary layer of air next to the leaf. Moving air will replace this depleted air with fresh air having a higher carbon dioxide content. If carbon dioxide is being added, a lower level is usually adequate to get the same plant responses, for instance, 800 – 1000 ppm rather than 1200 – 1500 ppm. Today many fan manufacturers and greenhouse suppliers carry fans that provide good air circulation. However, common installation errors include too little fan capacity, poor spacing and location of the fans and poor maintenance. Many systems could be improved with just a little work. For an efficient system, the total fan capacity should be about two times the floor area. For example, in a 30′ x 100′ greenhouse, the fan capacity should be 30′ x 100′ x 2 = 6000 cfm. If a tall crop such as tomatoes is grown or if there are hanging baskets, a slightly greater capacity is needed to overcome the additional turbulence created. Small, 1/10 to 1/15 horsepower circulating fans work well in providing the air movement needed. These are made to move air with little resistance as compared to exhaust fans that have blades designed to overcome the resistance of air moving through louvers or vents. The use of a permanent split capacitor motor can save as much as one-third the electricity of the more common shaded pole motor. If you have a hot air heating system, it may be possible to use the heaters, if they are positioned right, to replace one or more of the HAF fans. This could save installation costs but usually the fan motor on the heater is 1/3 or ½ hp and operating costs will be significantly higher. HAF fans are available with 12″, 16″, 18″ and 20″ diameter blades. Fan output and efficiency increase with increase in blade diameter. Guard design also affects output. The number of fans needed can be calculated by dividing the capacity needed by the output of one fan. In the example above of a 30′ by 100′ house, the fan capacity needed is 6000 cfm. If you plan to use fans that have 1675 capacity each, 6000 cm divided by 1675 cfm/fan = 3.6 fans. To get the capacity needed, use 4 fans. The first fan should be placed about 10′ to 15′ from one end wall to pick up the air that is coming around the corner from the other side. Subsequent fans should be located 40′ to 50′ apart to keep the air mass moving. If fans are spaced too far apart, the air mass will short circuit to an adjacent air stream and create a dead air cold spot. In a freestanding greenhouse, the air is moved down one side and back the other. This creates a circular horizontal air pattern. In gutter-connected ranges, it is more efficient to move the air down one bay and back in an adjacent bay. This eliminates the friction between the two, opposite moving air masses. The fans should be located near the center of the air mass to which they are adding energy. For greenhouses with floor or bench crops, a location 7′ or 8′ above the floor is good. 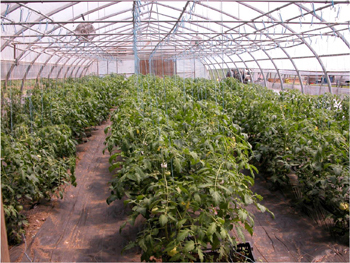 In many greenhouses there is a truss or collar tie that can be used for support. For a greenhouse with hanging baskets, a location below or above the basket level provides the energy with least resistance. It also eliminates drying of the foliage from a direct air stream. Fans should be located below the energy curtain so that air movement can be provided at night to keep temperature uniform. The HAF system should be operated 24 hours per day except when the exhaust fans are on or when the vents are open. A relay can be added to the circuit to switch the fans off when the ventilation system activates. Operating cost for one of these small fans is about $0.25/day at 10 cent/kilowatt electricity rate. Maintenance is also important in achieving high efficiency. Fans frequently get moved out of position. They should be restrained by a bracket or chains to keep them from moving. They should also be located to point directly towards the opposite end wall to transfer maximum energy to the air mass. Fan blade guard and motor casing pick up considerable dust from the air moving past them. It is important to wipe these several times a year. Movement of the air mass can be observed by lighting a non toxic smoke bomb behind one of the fans. Be sure to let the fans run for a few minutes before doing this to establish the horizontal pattern. Observe the movement of the smoke to see that there is no short circuiting. Also time the movement to get the flow rate. An incense stick is also a good tool that can be used to observe air movement in corners and around obstructions. The benefits of HAF have been around for many years. Fine tuning your system will improve its performance and increase its efficiency. Greenhouse Condensation Control, Improving Air Circulation. Ohio State University fact sheet.